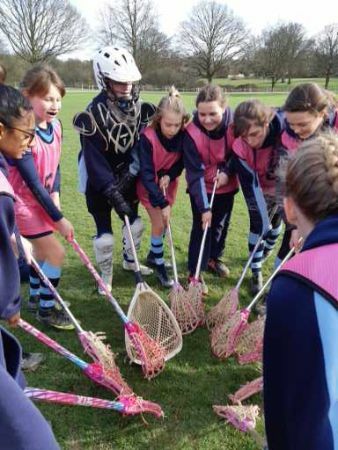 The girls enjoyed a wonderful afternoon of lacrosse at Benenden, playing in the B team tournament which ran alongside the U13A team event. Our first match was against DCPS. We started well and dominated most of the possession in the first half. Lucy G was first to score for SRS which lifted our confidence. In the second half we kept the fan open at our attacking end which encouraged some lovely play around the goal. Rose M and Tessa D were instrumental at running the ball down the wing and then crossing it on to the fan for someone to shoot. The defenders and Charlotte P, in goal, were not put to the test on this occasion as Meika R, Florence S, Floss S, Tessa D, Rose M and Lucy G were able to hold possession of the ball in our attacking half for the most part. Both Rose and Tessa were rewarded with a goal, to win the match 3-0. With a confident win under our belts, we then faced MHS. The balance of possession swung entirely in the first half with MHS giving our defenders plenty to do this time. However we held our nerve, with Rosie S, Eleanor S, Harriet A, Dulcie C and Charlotte Pr making good tackles and blocking effectively. Charlotte Pa also made some excellent saves and remained calm under pressure in goal. In the second half, we focused on developing our passing game to avoid being tackled and losing possession of the ball. This made a huge difference and a wonderful pass from Rosie S, out of defence, set up a super goal by Tessa D who caught the ball beautifully. Teams are often most vulnerable following a goal and this proved to be the case for us. With only minutes to go, we failed to block a swift counter-attack and MHS immediately scored to draw the match 1-1. 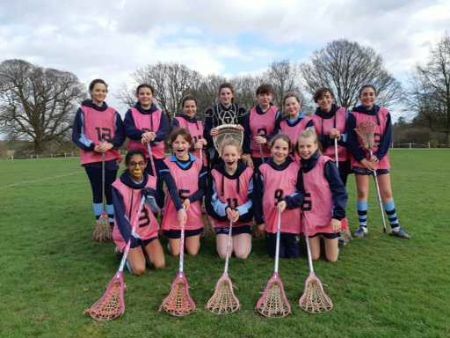 Our final game was against Benenden. We made the most of every opportunity, with Floss S executing brilliant attacking runs almost the length of the pitch to score 4 goals and Tessa D 1. Despite the legs tiring rapidly, the girls showed great focus and commitment to the end. The goals in this last game were to prove vital as we were tied in first place with MHS, having both won 2 and drawn 1. We were delighted to finish in first place over all, based on goal difference. A wonderful achievement, girls. Well done.